UltraThistle® is prescribed by doctors because it is much more effective at reaching and protecting liver cells than any other milk thistle formula. I've been taking milk thistle products for several years now. A few years ago I discovered UltraThistle®. Over these same years I've had regular lab work done in regard to my liver function. Even though I suffer from liver disease, my liver is functioning normally as has been documented by my lab work! I believe this is in a large part due to the UltraThistle® I've been taking. 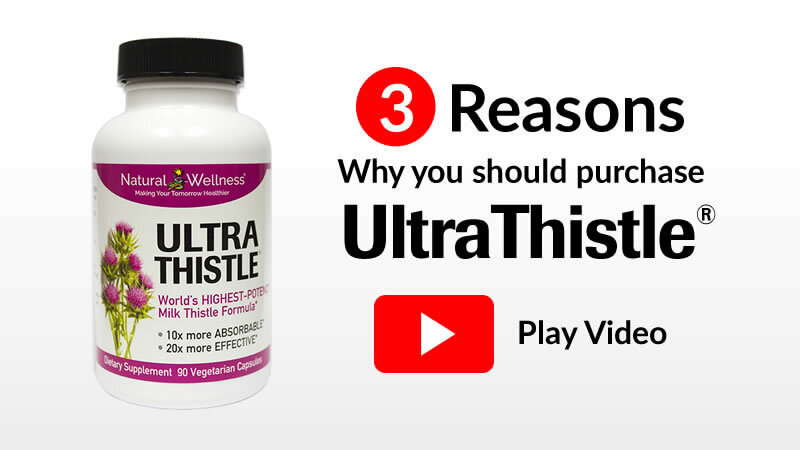 Medical research indicates the active ingredient in UltraThistle® is better absorbed, and produces better results, than any other silymarin or milk thistle extract. Additionally, this formula is part of an ongoing hepatitis C treatment research study at a foremost medical school AND a new hepatitis C dosing study at a major university medical center. This scientific validation explains why more and more doctors are prescribing UltraThistle®. And why more and more patients are choosing it to protect and support their liver. What is the evidence to support the claim that UltraThistle® is significantly better? This is the same question asked by doctors before giving UltraThistle® their approval. Several human and animal studies have shown UltraThistle® is dramatically better absorbed. In one study, the excretion of silybin in the bile was evaluated in patients undergoing gallbladder removal because of gallstones. A special drainage tube, the T-tube, was used to get the samples of bile necessary. Patients were given either a single dose of UltraThistle® or silymarin. The amount of silybin recovered in the bile within 48 hours was 11% for the UltraThistle® group and 3% for the silymarin group. This is nearly 4 times more in the bile. In another study designed to assess absorption, plasma silybin levels were determined after administration of single oral doses of UltraThistle® and a similar amount of silymarin to 9 healthy volunteers. The authors concluded UltaThistle was absorbed into the bloodstream roughly 8 times greater than regular milk thistle extracts standardized to contain 70-80% silymarin. Are there any scientific studies clearly indicating better results with UltraThistle®? Several clinical studies have also shown UltraThistle® to produce better results than regular silymarin extracts. In one study of 232 patients with chronic hepatitis (viral, alcohol, or drug induced) treated with UltraThistle® at a dosage either 120mg twice daily or 120mg three times daily for up to 120 days, liver function returned to normal faster in the patients taking UltraThistle® compared to a group of controls (49 treated with a commercially available milk thistle extract standardized to contain 70% silymarin; 117 untreated or given placebo). Better results were also seen in a preliminary study in patients with chronic viral hepatitis (3 with hepatitis B, 3 with both hepatitis B and hepatitis C, and 2 with hepatitis C) given UltraThistle® for 2 months. After Treatment, serum malondialdehyde levels (an indicator of lipid peroxidation) decreased by 36%, and the quantitative liver function evaluation, as expressed by galactose elimination capacity, increased by 15%. A statistically significant reduction of liver enzymes was also seen: AST decreased 17% and ALT decreased 16%. In another study designed primarily to evaluate the dose-response relationship of UltraThistle®, positive effects were again displayed at a level better than those reported for milk thistle extracts containing 70-80% silymarin. In the study, patients with chronic hepatitis due to either a virus or alcohol were given different doses of SILIPHOS®: 20 patients received 80mg twice daily, 20 patients received 120 mg twice daily, and 20 patients received 120mg three times daily for two weeks. At all tested doses, UltaThistle® produced a remarkable and statistically significant decrease of mean serum and total bilirubin levels. When used at the dose of 240 or 360mg per day, it also resulted in a remarkable and statistically significant decrease of the ALT and GGTP liver enzymes. These results indicate that even short-term treatment of viral or alcohol-induced hepatitis with relative low doses of phosphatidylcholine bound silymarin can be effective, but for the best results higher doses are indicated. The effectiveness of any herbal product (or medication) is dependent upon delivering an effective level of the active compounds. For milk thistle, this means delivering an effective level of silybin. It only makes sense that if you can increase the absorption and utilization of these components you will see better results. The following chart of clinical study results accurately represents the superior systemic delivery of silybin when administered as part of UltraThistle® versus 80% standardized silymarin or pure silybin. Notice how much more silybin reaches the bloodstream, and therefore the liver, when absorption is supercharged by the patented Phytosome® process. Again, you must remember that absorption is critical to the effectiveness of any therapeutic agent. Silybin cannot help your liver if it doesn't get into your bloodstream. 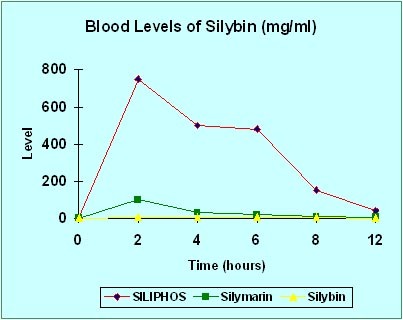 Without the Phytosome process used to make Siliphos®, very little silybin is absorbed. If you are currently taking an 80% standardized milk thistle product (the most common available under numerous brand names) your results are represented by the green line on the chart. Pure silybin is represented by the yellow line. And UltraThistle® is represented by the red line. This chart clearly shows how much more protection get to your liver with UltraThistle® (red) compared to 80% standardized (green). What is the dosage recommendation for UltraThistle®? Based on the clinical study data, when maximum liver protection and support is needed, the dosage recommendation is 360mg three times per day. This is three capsules per day. One bottle of UltraThistle® is a one month supply at the recommended dosage. Is there any danger in taking this higher dosage of such a powerful remedy? The German government did extensive research on milk thistle formulas and found that milk thistle has no known contraindications, no known drug interactions and no toxicity. In fact, German doctors prescribed enough milk thistle to liver patients in 1998 that sales exceeded $180 milllion in that country alone. Where can I learn even more about scientific studies regarding UltraThistle® and its active ingredient? How can I get prescription-strength UltraThistle® for myself?